The Representation of the People Act of 1918 granted the vote to women over the age of 30 who met a property qualification. The same Act gave the vote to all men over the age of 21. It also gave those in the Military the right to an absent vote. So nearly 33% of the men eligible to vote were serving their country in the war. 352 houses had no male voters; 142 of these had an absent male voter(s). The total of 315 serving men does not include those aged under 21. 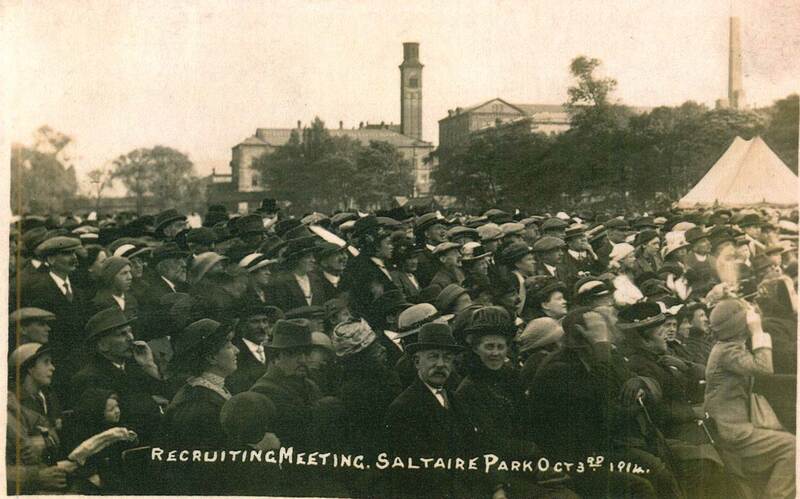 So the total number of men serving from Saltaire would have been higher. Below, the figures broken down into streets. J R Holmes & Sons – based in Bingley. Taken over by Hammonds Bradford Brewery in 1919 with 52 licensed houses. Aaron King & Co – Old Brewery, Cook Lane, Keighley. Brewing ceased after 1946. Timothy Taylor & Co Ltd – Knowle Spring Brewery, Keighley. Founded in 1858, registered in 1929. Still brewing independently in 2015. Hammond’s Bradford Brewery Co Ltd – Fountain Brewery, Manchester Road, Bradford. James Hammond bought the Fountain Brewery in 1860 from Joseph Pullan, Joseph had inherited a malting’s from his father Thomas Pullan which Thomas had started in 1830, Joseph started brewing on the site in 1840. Brewing ceased in 1955. J Hey & Co Ltd – Northbrook Brewery, Lumb Lane, Manningham. Registered in 1897. Taken over by Webster’s of Halifax in 1966 with 94 tied houses. Horton Old Brewery Co Ltd - High Street, Horton. Registered in 1914. Brewing ceased c1935. J & S Tordoff Ltd – Devonshire Arms Brewery, Thornton Road, Bradford. Registered in 1900. Taken over by J Hey & Co Ltd in 1919 and the brewery closed. William Whittaker & Co Ltd – Park Road, Bradford. Founded in 1757. Registered in 1897. Brewing ceased in 1928 and the brewery was demolished and replaced by a cinema. Bert Clark was the son of Arthur Clark. Arthur was born 1883 in Lincolnshire. He married Lucy Isadora Brigg in 1904 in Glanford Brigg, Lincolnshire. Bert, who had a younger sister, Gladys, was born 01 January 1906 in Shipley. He was baptised St Pauls Shipley 1 February 1906. In 1911 the family were living at 7 New Brighton in Shipley with Arthur working as Police Constable. By 1914 they were living at 12 Baker Street in Saltaire. From around 1918 they can be found living in Bingley. Bert died in 1975 in Barnsley. 1871 – William Wood (b1838 Huddersfield) Weaving Overlooker with wife & eight children (House built as No2 – renumbered between 1876 – 1881). 1881 to 1910 – Robert Heaton (b1851 Sutton in Craven) Mill Engine Fitter with wife & one daughter. Robert died 16 June 1910. 1911 to 1915 – Elizabeth Heaton (nee Child, b1846 Doncaster) widower of Robert. 1918 – Edith Anderson, (nee Fillingham b1870 Lincoln) widower of Arthur. 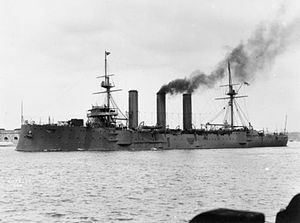 HMS Aboukir was a Cressy-class armoured cruiser built for the Royal Navy around 1900. Upon completion she was assigned to the Mediterranean Fleet and spent most of her career there. Upon returning home in 1912, she was placed in reserve. Re-commissioned at the start of World War I, she played a minor role in the Battle of Heligoland Bight a few weeks after the beginning of the war. Aboukir was sunk by the German submarine U-9, together with two of her sister ships, on 22 September 1914; 527 men died aboard the ship. One of many firms who donated to Saltaire Hospital. Lars took a photograph and he was kind enough to forward it to me. Many thanks. Photograph courtesy of Lars Ahlkvist, 2014. 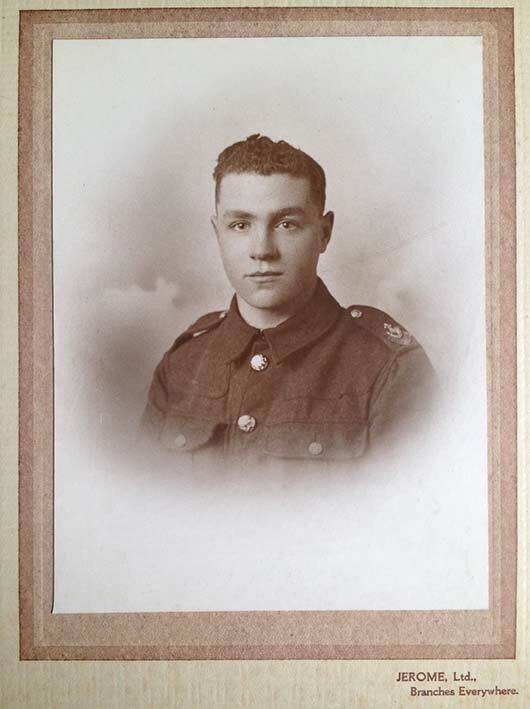 The photographs, below, of Tom Rutherford and his medal, were shared by Deborah Burns, Tom's grandneice. Deborah Burns writes: “Tom has never been forgotten in our family and my grandmother to whom I was very close, never really got over the death of her baby brother. She named her only child, my father, Tom (middle name Rutherford) in his memory. Tom, my Dad, served as a bomber pilot in the RAF during WW2 and although suffering horrific injuries in a Mosquito crash in 1942, used to say he was at least lucky enough to have come home, unlike his namesake. a grandniece of Tom Rutherford. "Buckingham Palace - all must realise that the present time of deep anxiety will be followed by one of considerable distress among the people of this country least able to bear it. We must earnestly pray that their suffering may be neither long nor bitter, but we cannot wait until the need presses heavily upon us. The means of relief must be ready in our hands. To ally anxiety will go some way to stay distress. A National Fund has been founded, and I am proud to act as its Treasurer. My first duty is to ask for generous and ready support, and I know that I shall not ask in vain. At such a moment we all stand by one another, and it is to the heart of the British people that I confidently make this earnest appeal. Edward." 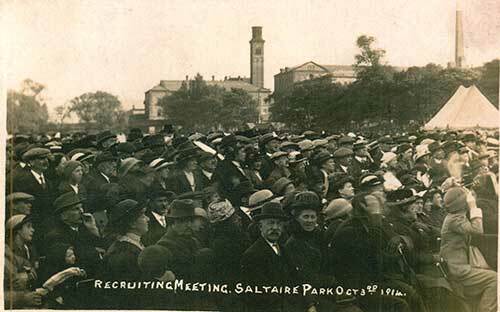 Work at Salts Mill, December 1914: Booming! Colin Coates: The attached quote from a local newspaper, 4th December 1914, shows that despite the war business for the mill is booming. We know that at the outbreak of the war just 4 months earlier the mill was put on short time working. What we don't know is what changed in that short time to warrant full employment and indeed overtime. "Not since the outbreak of the war has trade been so good in Shipley district as it is at present. Saltaire Mills illuminated at night tell their own tale. Four or five hundred workpeople are putting in overtime, and practically the whole of the remainder of the three thousand employees at these great mills are now working the usual hours. Another instance of the improved demand for labour was found this week, when the District Council officials required fifty men for excavation work in connection with the laying of a new water main in Moorhead Lane. They could only obtain half the number of men they wished to employ." Has any one seen a German Band? I want my Fritz, vot plays twiddly bits on der big trombone. HMS Kent was one of 10 Monmouth-class armoured cruisers built for the Royal Navy in the first decade of the 20th century. She was placed in reserve when completed in 1903, but was recommissioned for the China Station in 1906. She remained there until she returned home in 1913 for a lengthy refit. The Derby Scheme was a voluntary recruitment policy in Britain created in 1915 by Edward Stanley, 17th Earl of Derby. The concept behind the Derby Scheme was that men who voluntarily registered their name would be called upon for service only when necessary. Married men had an added incentive in that they were advised they would be called up only once the supply of single men was exhausted. The scheme was also referred to as the "Group System" as men were classified in groups according to their year of birth and marital status and were to be called up with their group when it was required. The scheme proved unsuccessful and was abandoned in December 1915, in spite of the fact that the execution of Nurse Edith Cavell by the Germans, on 12 October 1915 was used in recruitment rallies by Lord Derby. It was superseded by the Military Service Act 1916 which introduced conscription. 215,000 men enlisted while the scheme was operational, and another 2,185,000 attested for later enlistment. However, 38 per cent of single men and 54 per cent of married men who were not in 'starred' occupations failed to come forward. During WW1, there were three distinct British Armies. The "first" army was the small volunteer force of 400,000 soldiers, over half of which were posted overseas to garrison the British Empire. This total included the Regular Army and reservists in the Territorial Force. Together, they formed the British Expeditionary Force (BEF), which was formed for service in France and became known as the Old Contemptibles. The 'second' army was Kitchener's Army, formed from the volunteers in 1914–1915 destined to go into action at the Battle of the Somme. The 'third' was formed after the introduction of conscription in January 1916, and by the end of 1918, the army had reached its maximum strength of 4,000,000 men and could field over 70 divisions. The vast majority of the army fought in the main theatre of war on the Western Front in France and Belgium against the German Empire. Some units were engaged in Italy and Salonika against the Austro-Hungarian Empire and the Bulgarian Army, while other units fought in the Middle East, Africa and Mesopotamia—mainly against the Ottoman Empire—and one battalion fought alongside the Japanese Army in China during the Siege of Tsingtao.